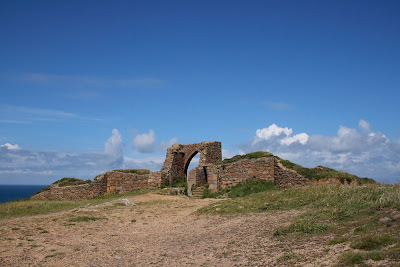 This partly runied castle lies in the far north-western corner of Jersey. The castle is thought to have been built during the 14th century for Sir John des Roches. As you can make out in the above photo, the castle is built on top of the rocky cliffs, with the sea on the north side. The main gate entrance is mostly still in tact, whilst the less substantial walls on the north side are mostly gone. Although you can still find the footings of the missing walls. Thanks to the steep cliffs on the north side, and the strong granite walls on the south side, this castle would not have been so easy to capture. However, because it is built on very solid granite, there would have been no water well. This seems to be a major flaw, in that any attacking force could have simply waited for the castle's water supplies to run dry, before demanding a surrender. The finer details of this castle's design are not known, due to its age and lack of proper records. This is a nice spot to visit around sunset, with good views across the water to Guernsey and the other islands. This is mostly a collection of photos taken whilst I'm out and about in Jersey. Perhaps, it will give you some ideas of places to visit for walks and out-door activities. I live on the Channel Island of Jersey, and enjoy photography and graphic art work.